Newsroom Fact Sheets BOULEVARD BREWING CO. LOCATION: Located less than 5 minutes southwest of downtown KC. HIGHLIGHTS: The Brewery offers several tour options for visitors. Public tours are available seven days a week. This 60-minute walking tour starts in the Tours & Rec Center and takes guests through the production facility to learn the history, brewing process and business behind Boulevard. The tour concludes back in the Tours & Rec Center, where guests 21 and over can sample select Boulevard beers. Tour tickets are $5 each (free on Wednesdays). The Smokestack Tour & Tasting ($25 per person) combines a two-hour walking tour of the production plant with a guided tasting session and food pairing of the acclaimed Smokestack Series beers. Private guided walking tours ($20 per person, with a 10-person minimum and 25-person maximum) are available upon request, Monday through Thursday. Get straight to the sampling at the Beer Hall, open seven days a week. Featuring a rotating lineup of brews available in full pours, tasters and flights—perfect for sampling a wide variety of Boulevard’s offerings, including test flavors. HOURS: 8:30 a.m.-5 p.m. for Brewery; Tours/Rec Center hours include Mon.-Wed. 10 a.m.-8 p.m., Thurs.-Sat. 10 a.m.-9 p.m., Sun. 10 a.m.-6 p.m. ADMISSION: Smokestack ($25) and Unfiltered Tour ($30) tickets are available for booking on the first Monday of every month at 10 a.m. and are offered on a first-come, first-serve basis. Private tours costs $20. Public tours tickets are available for purchase in the Tours & Rec Center at the beginning of each day. Tickets must be purchased in person; each individual can buy up to four. 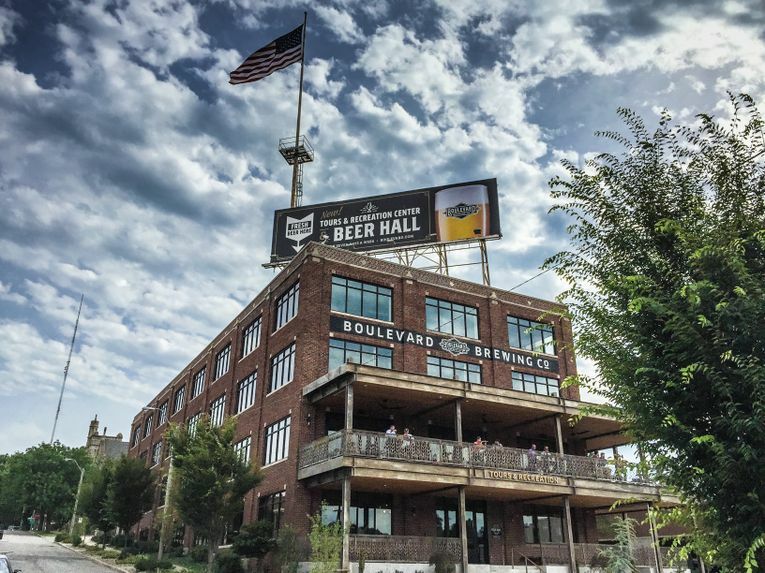 HISTORY: The Boulevard story began in 1988 when founder John McDonald started construction of the brewery along Kansas City’s historic Southwest Boulevard. The first batches of beer were produced in 1989 and the first keg of Boulevard Pale Ale was delivered to a restaurant a few blocks away that fall. Fifteen years of steady growth later, sales exceeded for more than 100,000 barrels per year. In 2006, a major expansion to the existing brewery raised brewing capacity to nearly 600,000 barrels per year. Today, the three-story 70,000 square-foot building is a model of sustainable urban architecture and a beloved sight near downtown Kansas City. In 2014, Boulevard became part of the Duvel Moortgat family, a collection of artisanal breweries dedicated to the highest expression of the brewers’ art. Boulevard remains committed to its original mission, pushing boundaries and helping to re-define American beer. WHERE TO GET LUNCH: The Beer Hall features a menu of bar snacks and charcuterie. Nearby Southwest Boulevard has a great offering of local flavors, including several acclaimed Mexican options, such as Manny’s Mexican Restaurant or Ponak’s Mexican Kitchen. Crown Center, The Crossroads Arts District and Downtown are also nearby with plenty of great dining options. ANNUAL SPECIAL EVENTS: Sponsored by Boulevard, Boulevardia is a unique beer, food and music festival held each June. Created in 2014, this event attracts thousands to the historic West Bottoms area for three days of fun and festivities (and plenty of Boulevard brews of course!). WHAT’S NEW: The 10,000-square-foot Beer Hall, which opened in 2016, features 24 beers on tap, delicious food and an expansive deck with great views of Kansas City . DID YOU KNOW: Boulevard also has four unique event venues available for rental. Picturesque views of Downtown Kansas City make Boulevard the perfect place for weddings or corporate events. DON’T FORGET: To check back in the tasting room often as Boulevard will occasionally offer unique samples of brewery-exclusive test beers. GROUP TOURS: More information on tours can be found at tours@boulevard.com or 816-701-7247. PUBLIC TRANSPORTATION: Take the MAX to Summit and 25th Street. From the north: Take I-35 South to exit 1D. Turn right on W 20th Street then turn left on Summit Street. Turn right onto Southwest Boulevard and the brewery is on the left. From the south: Take US-71 N to exit 197 to merge onto 1-670 W. Take exit 2T onto I-35 S, take 1D to turn right onto W 20th Street. Turn left onto Summit Street and then right onto Southwest Boulevard. The brewery is on the left. From the east: Take MO-9 south to exit onto US-169 south. Then exit onto I-35 S and take exit 1D to turn right onto 20th Street. Turn left onto Summit Street and then right onto Southwest Boulevard. The brewery is on the left. From the west: Take I-35 N to exit 1C toward W Pennway Street. Turn right onto W Pennway and then bear right onto Southwest Boulevard. The brewery is on the left. PARKING: Limited free parking is available in front of the brewery for visitors.